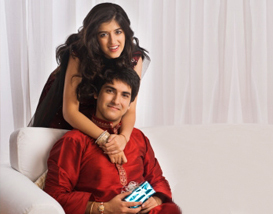 Raksha Bandhan Celebration - How Rakhi is Celebrated in India? In India, Rakhi celebrations are about strengthening the bond of love between brothers and sisters and fostering brotherhood. This festival is not a ritual, custom and tradition that can change over time but its style of celebration has become contemporary. Since ages, Raksha Bandhan is being celebrated in the same way. All the traditions are followed with the same enthusiasm. The gaieties have only blown up to a larger scale. 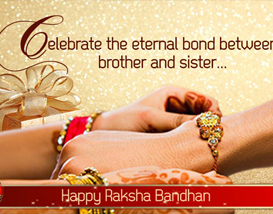 Rakhi festival is the celebration of the chaste bond of love amongst the siblings. Everyone start preparing for this festival much in advance. About a month before the commencement of raksha bandhan, you can see fancy and colorful rakhis in every market. Ladies start shopping for rakhi and rakhi gifts quite early. They shop for new clothes and beautiful rakhi gifts specially the one that have to be sent to their brothers staying far. Almost every shop, be it sweet shops, garment shops, gift shops, or any other shop, all are flooded with attractive rakhi gifts to attract people. The celebration of Rakhi, in India, is well known for its carnival spirit and strengthening the bond of love between brothers and sisters. 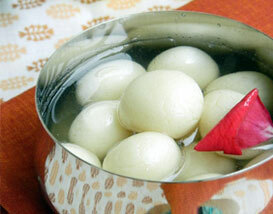 In fact, India is globally known for its colorful festivals and ever-green tradition. Celebrated with different rituals, family get-together and sweets, Raksha Bandhan is about sentiments, love and enjoyment. 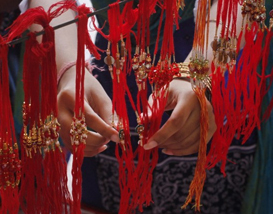 Like any other festival, rakhi has its unique significance. On the day of Rakhi festival, the festivity of this auspicious day begin by the day break. After taking bath early morning, people get ready by wearing new clothes and gather for worshiping. After invoking the the blessings of the Gods, the sister performs brother’s arti, puts tika and chawal on his forehead and ties Rakhi amongst chanting of mantras. Sisters whole heartedly give sweets to their brothers to eat which in turns add more sweetness in the Raksha Bandhan celebration and pray for their well being. In return, brothers pamper their sisters and present beautiful gifts to lure them. They also promise to take care of her and stand by her side in any circumstances. 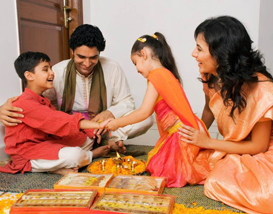 After performing all these rituals, the whole family reunion to enjoy and have fun. Then all of them share the delicious food, tasty sweets, gifts, music and dance. It is a day to remember all the memorable time spent together for those who, for any reason, are far away from their family. Emotions can also be expressed through e-mails, e-cards, rakhi greeting cards and rakhi through Internet. The overflowing emotions of siblings cannot be stopped on this day. Rabindra Nath Tagore started gathering of people like 'Rakhi Mahotsavas' in Shantiniketan to propogate the feeling of brotherhood among people. He believed that the this will invoke trust and feeling of peaceful coexistence. Raksha Bandhan, for them, is a way to harmonize the relationship of humanity. The tradition continues as people started tying rakhis to the neighbor and friends.